"We have developed a special 'boutique' Human Brain Bank. We know the history of every brain we research thanks to our close relationships with the families. That’s only possible in a small country like New Zealand, and it means our tissue is in demand all over the world." Sir Richard Faull, Distinguished Professor, Director of the Centre for Brain Research. The Neurological Foundation Human Brain Bank is a world-class scientific resource unique to the Centre for Brain Research. This tissue provides vital clues about neurodegenerative diseases such as Alzheimer's, Huntington's and Parkinson's along with research programmes into Epilepsy, Motor Neurone Disease and Schizophrenia. 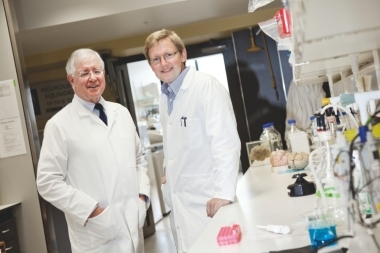 Sir Richard Faull is the founder and director of the Brain Bank. "Donating your brain for research is one of the most special and invaluable gifts to science." Our researchers treat the tissue with dignity and respect. There are both ethical and legal procedures relating to the acquisition of postmortem brains, which are strictly followed. Patients and family members usually decide to donate their brain years before death, so when the time comes the bequest process is both sensitive and efficient. It is scientifically important that the tissue is collected as soon after death as possible, ideally within 2-12 hours and all human brain tissue is carefully documented and stored to form a comprehensive human Brain Bank for the study of neurological disorders and brain diseases in New Zealand and overseas. "This is extremely sensitive and skilled work," says Sir Richard. "We're developing tikanga Māori practices so Māori researchers feel comfortable researching the human brain. A special donor information pack is available for potential donors and families, detailing the necessary procedures of bequeathing tissue to the Brain Bank. "Only by working together can we unlock the secrets of brain disease and help find cures to give people hope for the future. That's what our work is all about and we never forget that," says Sir Richard. Read more about the operation of the Neurological Foundation Douglas Human Brain Bank. The Neurological Foundation Human Brain Bank has the enthusiastic support of many community organisations: Alzheimer's Auckland, Alzheimer's New Zealand, Epilepsy NZ, Huntington's Disease Associations of New Zealand, Motor Neurone Disease Association NZ, Parkinson's New Zealand and Supporting Families NZ (formerly Schizophrenia Fellowship NZ). This unique resource is only possible thanks to the continued support of the Neurological Foundation of New Zealand. This national charity tirelessly fundraises to support research into brain diseases. The Foundation has generously supported the Human Brain Bank since 1993. Read more about the Neurological Foundation Douglas Human Brain Bank here.